Anchorage) — Done using your outdoor hammock for the season? When was the last time your kids actually went out to play on the backyard swing set? Moose have a way of getting tangled in things we leave draped, set up, or hanging outside, and items that can be put away until May — or at least when not in use — could save a moose from injury or death. "I think we've seen it all," said Anchorage Area Wildlife Biologist Dave Battle. "We've untangled moose from dip nets, extension cords, garden hoses - the list goes on." "This type of entanglement is fairly common with bull moose," said Lewis, "particularly in the fall." "We had a bull two years back that got hung up in a tire swing, broke loose, and became exhausted dragging the tire around," said Tim Peltier, Palmer area wildlife biologist. "By the time we got to him it was already too late to help, and we had to put him down." If reported, biologists may save entangled moose from death or suffering, but prevention is best. 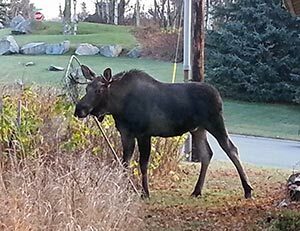 "Consider moose when you set up Christmas lights, volleyball nets, dog runs — anything outdoors that could lead to an entanglement for moose," said Battle. To report entangled moose, visit www.adfg.alaska.gov and click on the "Report a Wildlife Encounter" button on the upper right side of the page, or phone the department office nearest you. For more information, contact Dave Battle at david.battle@alaska.gov.